The livestock industry is working hard to minimize stress to animals during all stages of production. The recent renovation of the livestock-working facility at North Dakota State University’s Carrington Research Extension Center (CREC) may provide ideas to producers developing their own working facilities. The objectives of the renovation were to reduce stress to animals during processing, increase the labor efficiency and safety of herdsmen, and to enhancing research capability. The renovation plan was developed by the CREC livestock research faculty and staff, with the help of Tim Olson, CATL Resources, and manufactured by Ray Barnhardt of RB Mfg. and Sales. The new design was created to work within the existing physical setting, namely building size and orientation, animal entry point and access points for people. This publication is a synopsis of the renovation and functionality of the CREC animal working facility. Overhead view of the north barn with outside holding pens, alleys and loading chute on the south side. Barn dimensions are 64 feet by 40 feet. Livestock handling philosophies and techniques have changed through time. The photo below illustrates classic design flaws in livestock-handling facilities. 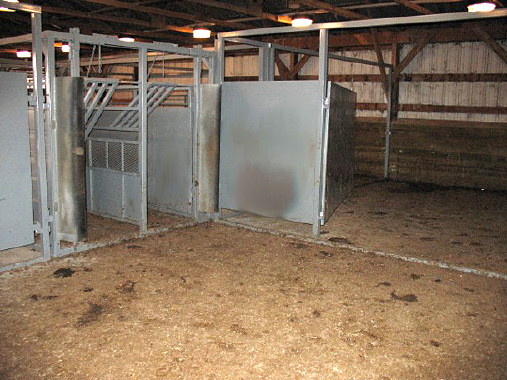 In this system, cattle are forced through a small door into a darkened barn from an outside alley/holding pen. Concurrent with entering the barn, the animals must push through spring-loaded backstops protruding from the side of the alleyway. The backstop and the straight-on movement cause cattle to hesitate at the entrance door and balk in the short, single-animal alley before entering the scale. This flow pattern is especially challenging for newly arrived or very flighty animals. Original scale and chute design in the CREC north barn installed in 1972. Cattle entered from the north into a single alley with one animal space ahead of the scale. Animals exited through the south door after passing through the squeeze chute where processing procedures were done. The straight-in design in a poorly lit environment made loading the chute difficult, and the loud, clanging chute caused cattle to balk. The renovation included installation of a Silencer hydraulic squeeze chute, a single-animal scale with hydraulic center-opening gates, and a single-animal alley section leading into the scale, which is fed from a double-animal alley that is loaded from a small staging pen, referred to as a “Bud Box.” The Bud Box concept was developed by Bud Williams, Bowie, Texas. This progressive animal-working concept incorporates a blind-end rectangular pen at the apex of the cattle flow where the animals turn back in the direction they came from, flowing into the working alley (see Diagram 1). Cattle are allowed to exhibit their normal behavior, turning back to where they came from. In turning back, they enter the double alley relatively easily. 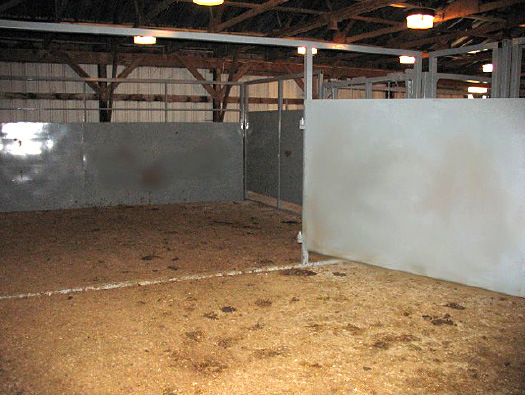 The solid-sided staging pen gives animals more motivation to move into the open double alley. The renovation also included 21 all-weather lights in the ceiling of the barn to eliminate shadows and dark spots in the barn. The original single-animal-width entry door was expanded to 7.5 feet wide (distance between poles) to allow groups of animals to enter the barn together. A roll-up door was installed with a gate to protect it. In the right photo, heifers move through three small holding pens to enter the staging pen. The small holding pens were constructed to serve the research mission of the center. A gate protects the sliding door, which can be used to sort animals. Note the multiple ceiling lights that eliminate shadows and dark areas. The staging pen should be loaded with about the number of animals that will fill the entire alleyway. The herdsman closes the solid gate behind the cattle in the staging pen and the cattle move toward the dead-end portion of the pen. The herdsman then moves along the gate and past the double alley entrance toward the opposite corner of the staging pen from the gate latch. The herdsman should pause for a few seconds until the animals turn around and begin to move back toward the entrance to the double alley. The animals circle back past the herdsman and enter the alley easily with less stress to the animals and herdsman. No other people should be in the area as distractions outside the staging pen to impede the natural flow of the animals. Animals may be worked into the alley from outside the pen if gates and panels allow visibility for the herdsman and the cattle. Cattle move into the double alley from the staging pen and past a spring-loaded swinging gate into the single-animal alley before entering the scale and chute. Expanded metal in the center panel allows animals in adjacent alleys to see each other, which lowers stress levels. The width of the double and single alleys is easily adjustable. The Silencer hydraulic chute is relatively quiet and enhances cattle flow by use of visual barriers. The hydraulic reservoir and pump are enclosed along the outside wall and connect through overhead hoses. The center-opening hydraulic gates on the scale operate on the same hydraulic system. This CREC design has unique adaptations for the space available and for the research mission. 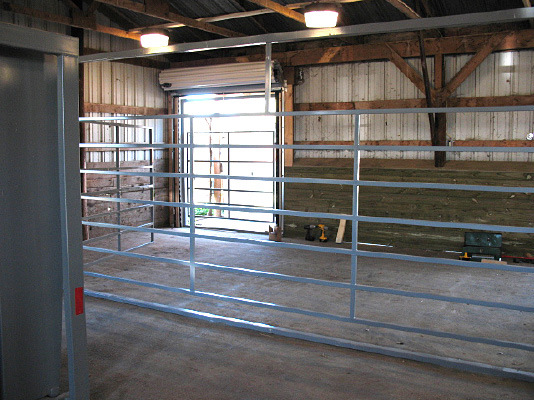 The same principles of cattle movement and flow apply to commercial facilities, but the size and arrangement of the holding pens, and the length of the double and single alleys may vary. Working facilities must be adapted and appropriately oriented to each site to maximize the use of natural cattle movement tendencies. We would like to express appreciation to the North Dakota Corn Utilization Council for a grant that supported the purchase of the Silencer hydraulic chute installed in this facility. We also express appreciation to CREC technicians Dale Burr, Tim Schroeder and Tyler Ingebretson for extensive contributions in the design and renovation. Trade names, labels and companies are mentioned for clear communication. No endorsement is implied nor criticism intended for those mentioned or not mentioned. Silencer is a registered trademark of Moly Manufacturing, Lorraine, Kan.